Yellow Kaudi or Peeli Kowdi or Yellow Cowrie shell is of great significance in the worship of Goddess Mahalaxmi and Lord Vishnu. Yellow Kaudi is also used during the pooja of Goddess Baglamukhi. 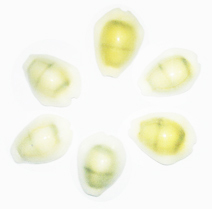 Many spiritual and tantrik pooja processes are completed successfully with the aid of Yellow Cowrie. In Astrology, Yellow Kaudi is used to balance the planetary effect of Jupiter and the malefic effects of Ketu and Rahu. Keeping 11 Yellow Kaudi peeli kawdi in one's place of wealth bestows the blessings of Lord Kuber and goddess Lakshmi. On the auspicious occassion of Dhanteras and Akshay Triteeya, Yellow Kaudi must be kept at pooja place after wrapping in yellow cloth. This ensures a smooth flow of money in the family. People suffering from minimal savings despite good earnings must keep 21 pieces of Yellow Cowrie kaudi in the north-west part of their room. Yellow Cowrie or Peeli Kauwdi or Yellow Kawdi must always be used in odd numbers i.e. 1,3,5,7,9 or 11 and so on. Yellow Kaudi must be wrapped in a yellow cloth to get the fullest benefits. Ensure that the yellow kaudi has smooth edges and is not broken on the sides. Yellow kowdi with a ridge like structure on the smooth side are considered more auspicious than those kaudi which are smooth.